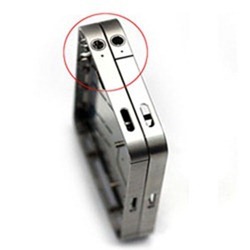 Next Generation iPhone 5 Parts Leaked on Video? A firm called GlobalDirectParts claims to have the parts of the next generation iPhone. They have uploaded a detailed video showcasing the parts of the next iPhone, which they are referring in the video as the iPhone 5. The casing is still made from aluminum, and it has a micro-SIM card slot. This suggests that the device uses the GSM bands, or it could be a global CDMA phone for Verizon. Apart from that, there are some differences from the current generation iPhone 4, such as the new iPhone 5 has the black separation lines on different spots as can be seen in the images attached above and below. To see it all for yourself, watch the video embedded below. At the beginning of the video, the company seems to have a fully assembled next-gen iPhone (at 0:23 to be exact). And at the end of the video, they say “More coming next week.” As always we will keep you updated. Stay tuned.